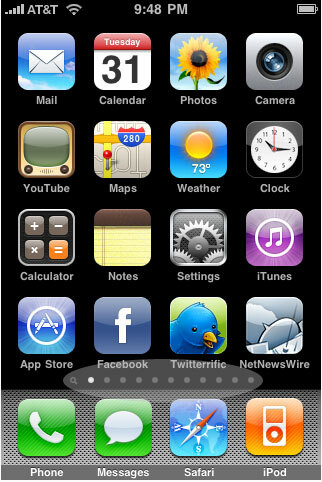 iPhone 3.0 - CIS 4372 HCI and Data Viz. 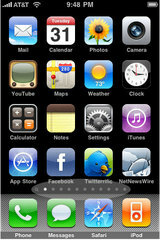 Is consistent 5 iPhone 3.0 has a very consistent interface. The multiple desktops all contain a "dock" at the bottom of the screen with 4 static icons that allow the user to access these "apps" from any desktop. All of the settings windows and native applications have similar design and functionality. Caters to universal usability 4 This interface does a pretty good job at catering to universal usability. The touch interaction is easy to learn and use by all users. Offers informative feedback 2 iPhone OS doesn't really offers very much feedback to speak of. The user doesn’t get a specific notification if a message is sent, if a setting is saved, or even if an application fails during use. Feedback is provided when a call fails but no specific information is provided to prevent the problem in the future. Provides dialogs that yield closure 2 iPhone 3.0 provides virtually no notification of closure. When any of the various applications are closed, the OS returns to the desktop it was previously at with no notification to the user. After a new feature is set up, such as an email client, the OS does provide notification of success or failure and gives suggestions when necessary. Prevents errors 3 The interface is pretty good at preventing user errors by not allowing a user to change unnecessary settings and also preventing them from deleting necessary files and folders. However, there are some common errors that are present in various parts of the interface. Permits easy reversal of actions 4 The user can easily return to their home screen by tapping the "home" button. The interface also provides a back arrow that will take you to the previous page in an application if applicable. There is no way to change one setting back to its default or undo a change without knowing what the previous value was or by resetting all of the phone's settings to their default values. This could be very frustrating to a user that accidently changed a setting and doesn't know the previous value. Offers support for internal locus of control 2 iPhone 3.0 really doesn’t give the user very much control over the looks or functionality of the interface. There are no themes that can be changed and only a handful of settings that can be modified to give the user more control over the interface. Reduces short-term memory load 5 The OS is good at reducing short-term memory load of the user. In order to use the basic functions of the phone, very little training is needed and therefore the user doesn’t have to remember a lot of information to use this interface.